I was recently contacted by The Cheese Market and asked whether I would like to review one of their cheeses. They kindly offered for me to choose one from their website and I really liked the look of the Little Wallop. 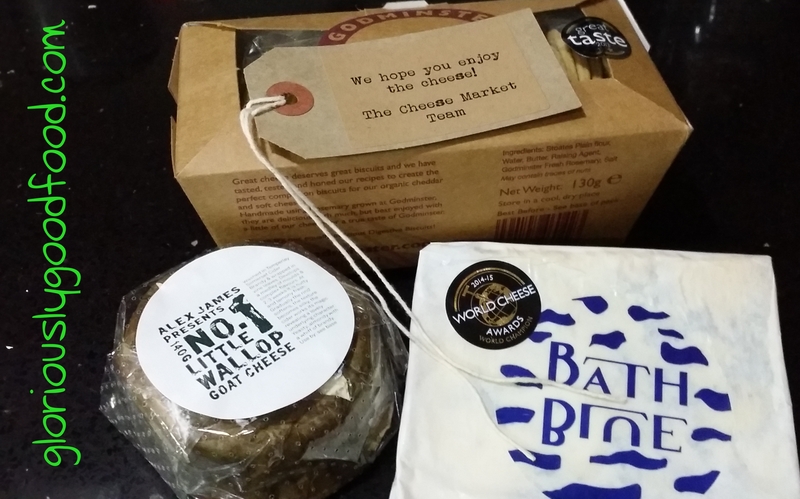 My first pleasant surprise came, therefore, when they sent me not just the Little Wallop but also the Organic Bath Blue, plus some delicious Godminster Rosemary Water Biscuits to go with the cheeses. I particularly liked the little touch of the ‘We hope you enjoy the cheese’ tag. The cheeses were courier-delivered and came in solid cardboard packaging, clearly marked as perishable and with lots of padding inside the box (as well as ice packs) to protect and preserve the cheese. So lots more ‘ticks’ there. The one I received was lovely and ripe, with the characteristic slightly pungent smell, without being overpowering. I always prefer the ‘gooey’ parts of goats’ cheese, found closest to the rind, but even the harder-textured centre was delicious. The centre was less ‘goaty’ than the soft gooey bits nearer the rind. The cheese has a lovely balanced flavour, with a hint of nuttiness and pungency and a distinctive ‘goatiness’ about it. The vine leaves wrapped around the rind add an interesting dimension. Almost reminicent of basil flavour, the dried vine leaves add a crunchy texture and a sweetness that balances the cheese beautifully. The ‘Little Wallop’ is adorably named and definitely a treat to savour and enjoy. At £7.50 for 140g it’s not a low-cost everyday treat, though. But if you’re after a really classy, tasty little cheese to enjoy on its own, with biscuits or perhaps with a full-bodied red wine, then this is definitely one I’d recommend. Make sure you leave it out of the fridge for at least 30 mins to soften to allow you to savour it at its best. I particularly like the soft squishy bits! I am quite picky about blue cheese and generally have a preference for lovely creamy Italian Gorgonzola, though I have eaten some delicious Blue Stilton on occasion. Receiving this blue to review was an unexpected treat and boy, am I glad The Cheese Market sent me it! The Organic Bath Blue is strong and pungent, from its aroma to its flavour, it leaves you in no doubt about its character! Rich in blue veins running throughout it, this cheese goes beyond pungency, however. It even LOOKS creamy, as the white parts are not white; they are almost yellow and scream out ‘I am creamy’. This cheese is rich and indulgent. The creamy taste and texture complement the pungency to perfection. A cheese to be savoured! Again, not a low-cost treat at £7.95 for 250g, but it is so rich that its flavour goes a long way. Definitely one you should try if you are a lover of blue cheese and very worthy of its World Champion Award at the World Cheese Awards. A World Champion of Cheeses! I’d like to have something to recommend for improvement to give a more balanced review, but there was nothing I didn’t like about the cheeses. The only thing I can say is that they are on the pricey side, but then you would expect to pay for this level of quality, not just quality of the cheeses but attention to detail in the packaging and delivery, too. Outstanding!